At the 2019 Pennsylvania Association of Sustainable Agriculture (PASA) Farming for the Future conference held in Lancaster, PA, Rodale scientists Drew Smith and Gladis Zinati presented the results of their two year research project with Dickinson College Farm manager Jennifer Halpin. Drew and Gladis oversaw a research project at Rodale Institute in Kutztown, PA while Jennifer Halpin and Daniel Landis of Landisdale Farm participated as farmer collaborators trialing organic no-till technologies on their farm. This project is part of a larger initiative to develop strategies to reduce tillage and improve weed control in organic vegetable systems without sacrificing yields. The roller crimper was developed at Rodale Institute to terminate or kill winter annual cover crops before direct seeding or transplanting crops. This method has been well developed for grain crops but there are still limiations in vegetable crop production. Some of the limitations include cultivation methods if weeds are not well controlled and reliable transplanters. The current recommendation for this method is to till soil in the fall to ensure good establishment of cover crops and to reduce weed pressure. 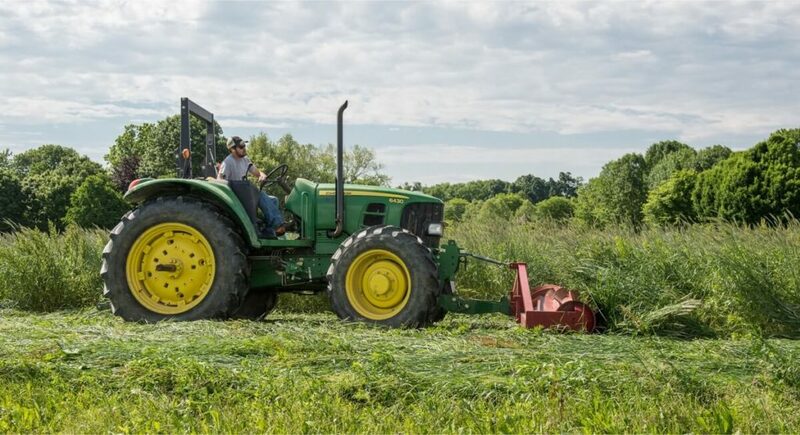 Some farmers will make several passes with a disk, rotary hoe, or tine weeder after plowing in the fall and before planting cover crops (stale seedbed method). While these are good, proven methods to manage weeds, these methods still include repeated tillage passes that can negatively impact soil health. Continued tillage and cultivation in organic systems can result in “exhausting” the soil fertility, reducing soil health, and result in difficulty maintaining high yields without synthetic fertilizer. 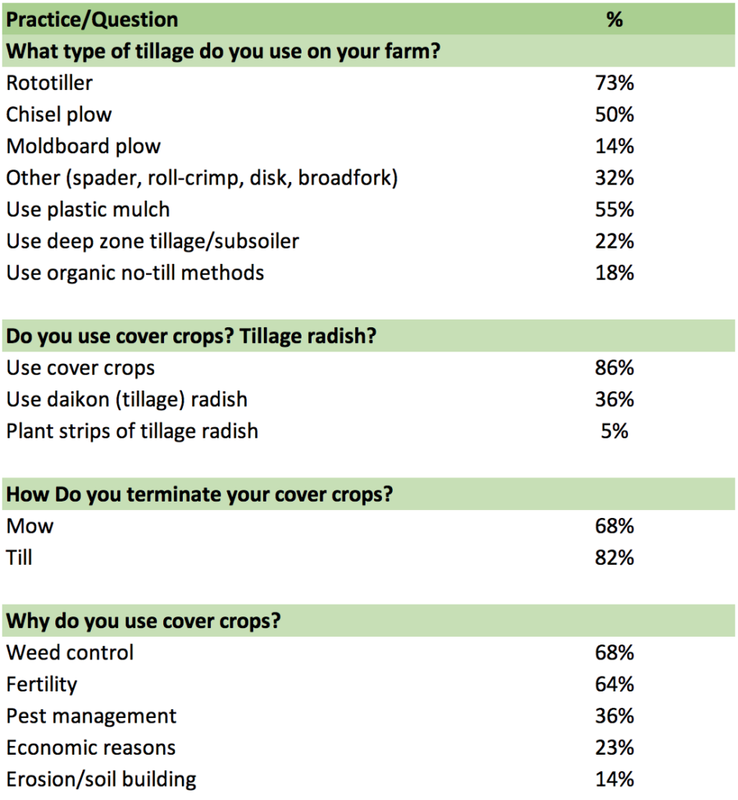 Survey results (Table 1) suggest that the majority of vegetable farmers in Pennsylvania and the mid-Atlantic region rely on high levels of tillage to establish cover crops, manage weeds, and preparing fields for planting. The majority of organic vegetable farmers are using cover crops to help manage weeds, improve crop fertility, and improve soil health (erosion). Diligent use of cover crops/green manures is surely helping organic vegetable farmers maintain soil health. Yet few farms (18%) have tried the Rodale organic no-till method. The biggest reasons given for not adopting this technology was the cost of new equipment, getting the right equipment, and getting the timing right. Results collected from 22 farms, totaling 273.5 acres. We, at Rodale Institute, are committed to developing and improving strategies to help organic farmers be more successful, to help feed the world without chemicals, in order to improve human and planetary health. Please help us in this effort by adding more participants to our survey.